Some wheelchairs weigh a ton, and others have a fixed, rigid frame. Those styles aren’t ideal for a person who wants to be on the move or for an individual who craves independence. A wheelchair that’s easy to push and that folds up for compact storage is perfect for someone who’s on the go and who wants to remain active for as long as possible. Although wheelchairs have been around for centuries, the first folding wheelchair didn’t come onto the scene until the 1930s. Before then, wheelchairs tended to be large, bulky objects. They made it possible for a disabled person to get around, but they were also difficult to store and transport. In 1919, Herbert Everest, a mining engineer, was permanently paralyzed after a mine cave-in, according to the New York Times. Confined to a wheelchair for the rest of his life, he often complained about the bulk of the chair. His friend, Harry Jennings Sr., a mechanical engineer, heard his complaints and set out to make a better chair. Jennings developed the first folding wheelchair in 1933. The foldable chair had a steel tube frame and could collapse down and tucked away in a closet or a car. Ultimately, the pair would go on to form Everett & Jennings, which became a leading wheelchair manufacturer for decades. Although wheelchairs have continued to evolve and develop over the years, the lightweight folding model continues to be an attractive option for many people. Although you might assume that a folding or collapsible wheelchair is going to be the better option in most cases, that’s not always true. Some people do benefit from having a rigid frame wheelchair over a collapsible frame. For example, if you need a customized wheelchair for your loved one, it is often easier to go with a rigid frame. You’ll find more options regarding seat width and height, and regarding cushions, armrests and leg rests in a fixed frame model compared to foldable models. Depending on the size and weight of your loved one, you might find that rigid frames offer more options than a folding frame. 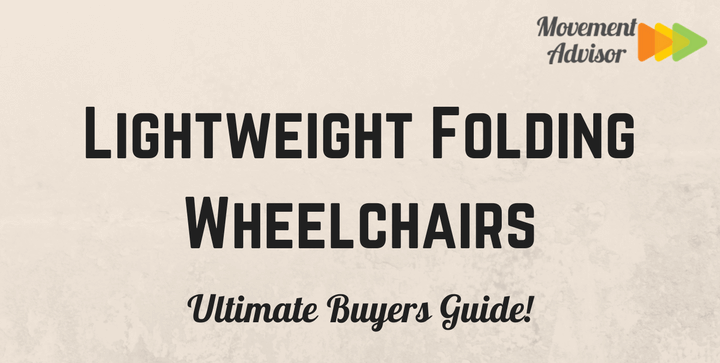 Rigid wheelchairs also tend to weigh less than folding models, although lightweight versions of each are available. Depending on your needs or the needs of your loved one, it might make the most sense to have a rigid frame, lightweight wheelchair for everyday use and a folding wheelchair for travel or occasional use. The best lightweight folding wheelchair for one person might not be the best option for another. Several variables determine whether a chair is a good fit for you and your loved one or not. Size. Just as people come in all shapes and sizes, so do wheelchairs. An average-sized individual can usually fit comfortably into a 16-inch, 18-inch or 20-inch chair. But a heavier person might need a bariatric chair or an extra wide seat. Additionally, taller people might need a chair with a higher seat height. Self-Propelled, Foot-Propelled or Push. Lightweight wheelchairs are often ideal for people who will move the chairs on their own, either by turning the back wheels or by walking the chair with their feet. Push wheelchairs do tend to be heavier than self-propelled, but it is possible to find a lightweight transport chair. Seating. How long a person will be in a folding wheelchair determines how much emphasis you put on the comfort of the chair. For example, you might want to invest in a chair with durable, comfortable memory foam pads if someone will use it daily. But if you’re looking for a wheelchair to use when traveling, less cushioning might be acceptable. Armrests and Leg Rests. Armrests and leg rests that move out of the way are ideal since they make it easier for an individual to get into and out of the wheelchair. Desk length armrests can often be preferable, as they tuck away easily and can fit underneath a table. Companion Handles. Even if your loved one is mainly moving the chair him or herself, a model that has companion handles on the seat back can be preferable. Companion handles make it possible for you to push the chair from behind when you’re walking with your loved one. If the person in the chair gets tired of pushing, you can take over for them. Weight Limits. For the most part, lightweight wheelchairs typically have a weight limit between 250 and 300 pounds. If your loved one weighs more than that, you’ll need to look for a bariatric chair that can accommodate his or her weight. The limit on bariatric chairs varies from model to model. Some can support loads up to 550 pounds. Others can handle up to 700 or 750 pounds. A wide range of lightweight folding wheelchairs is available. You can find relatively low-priced models that offer few frills and are ideal for occasional use. At the other end of the price spectrum, you can find high-end wheelchairs that have everything you need for everyday use. The Drive Medical Super Light Folding Transport Chair sort of resembles a folding beach chair. It has a blue padded seat and a style like a folding patio chair. It even folds up like your typical folding chair. The chair’s small size and light weight (just 19 pounds) make it ideal for use as a travel chair. The next time you and your loved one are going to the mall or for a walk around town, this can be the chair to take, since it weighs little and folds nicely for storage. But the shape of its seat and the size of its armrests make it not the best chair for sitting in for long periods. Although the armrests do flip back for storage, you can’t adjust their height when sitting. They are also short and don’t look particularly comfortable for resting your arms on. Since it is a transport chair, it doesn’t have large wheels for self-propelling. Instead, it’s meant to be pushed by a companion. The chair is low enough to the ground (the seat height is 17 inches) that a particularly tall user could propel the chair with his or her feet. The Karman Healthcare LT-1000HB-BD Folding Aluminum Transport Chair features a simple design and a few more bells and whistles than the Drive Transport Chair. It weighs in at 23 pounds, so it’s a bit heftier, too. The wheelchair has a seat width of 19 inches and a back height of 18 inches. It can support up to 250 pounds. Although swing-away leg rests come standard on the chair, you have the option of upgrading to elevating leg rests for an additional cost. The elevating leg rest option might be a good pick if your loved one has issues with swelling or blood flow in the legs. Lifting the legs up can help minimize swelling and improve circulation. Armrest options on the chair are more limited than the leg rest options. It has full length, fixed armrests. That can be a fine option if you’re using the chair for transport only. But it can make it difficult for your loved one to sit in the chair at the dinner table or to sit at a desk while in the chair. TheDrive Medical Blue Streak Wheelchair has the most features and more options compared to the other two lightweight folding wheelchairs. It comes in three sizes: a 16-inch seat, an 18-inch seat, and a 20-inch seat. You also have the option of choosing swing-away leg rests or elevating leg rests. Two features really set the Drive Wheelchair apart from the rest. One feature is the two large rear wheels which allowing the person using the chair to self-propel. Of course, the drawback of those bigger wheels is that the chair weighs more than other models. Although it’s still technically “lightweight,” it weighs slightly more than 40 pounds. The other notable feature is the desk-length armrests, which easily swing out of the way with the press of a button. Whether you decide to use a folding wheelchair as your main ride or are looking for one for travel or occasional use only, choosing a chair that’s comfortable and easy to maneuver is critical.